Have you ever wanted to participate in a challenging and intensive Boot Camp immersion program? Coming in December 2012, join Greg Amundson for the challenge of your life. 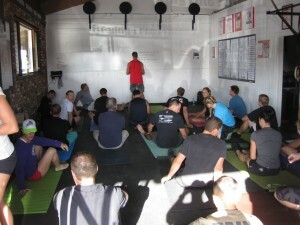 This intensive six day Boot Camp will focus on instilling the warrior ethos and forging elite fitness and leadership. The learning will take place in a structured and disciplined environment with resemblance to a traditional Military training program and Assessment and Selection Course. Training evolutions are based on Greg’s experiences in the Military, Drug Enforcement Administration (DEA) and mentorship with Mark Divine in Warrior Yoga and Unbeatable Mind Training. Boot Camp Evolutions will include arduous physical tasks, ocean swims and timed exposures, long distance ruck-marches and runs, traditional CrossFit Hero WOD’s, team evolutions, Warrior Yoga, meditation, breathing exercises, reading assignments and group presentations. Stay tuned for updates at the gym on this exciting opportunity! Anyone down for a surf or bodysurf session? Greg, you got a suit and fins….lets go NOW!!!! This sounds amazing! What are the dates?? ?